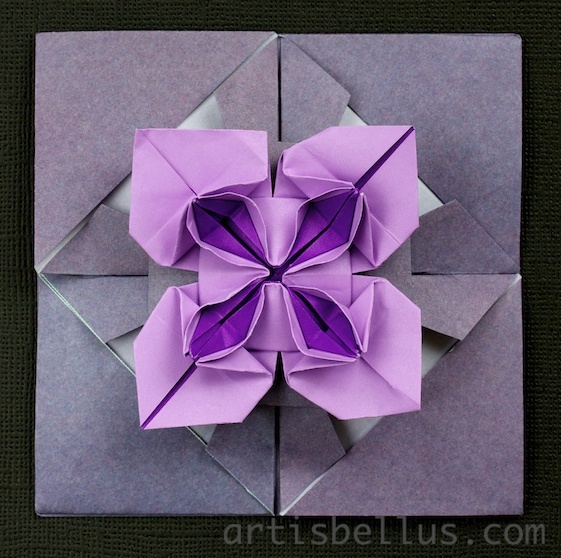 I love making origami cards, so I couldn't help to make one for Mother's Day. 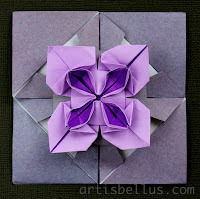 This card is made of three pieces of paper: One for the envelope, one for the flower that acts as a lock, and another for the message that goes inside. one 4" (100 mm) of yellow tant paper for the Wildflower (diagram here). one 4" (100 mm) square of yellow card stock for the message. 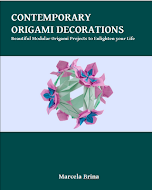 You can find the diagrams for the Wildflowers, Bicolor Wildflowers, Bicolor Bluets and other beautiful flowers in my book Contemporary Origami Decorations . Very nice your works,and very sensitives too!Congrats!! 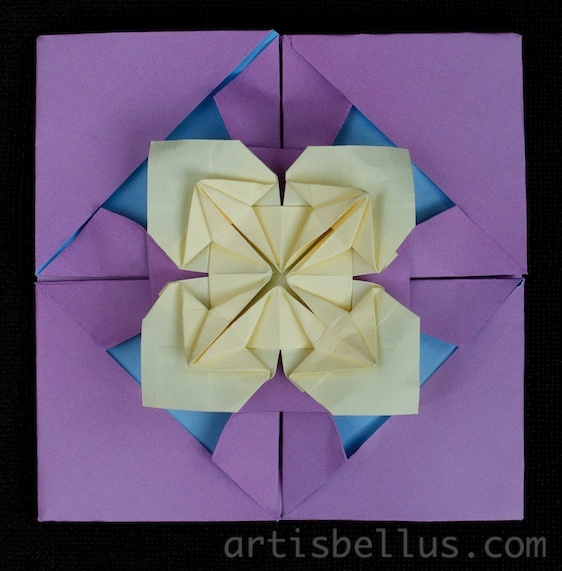 !You have beautiful ideas with these modular conections,so many inspiration i wish you! PS: What program you use for to make diagrames?I want to diagrame some personal models ...can you recomande me something good? I make my diagrams with Open Office Draw. It works very well for me. I know that other people use Inkscape, but I haven't tried it yet. Both of them are open source software. Have a nice day,and many inspiration in all your next activities and projects! I tried but i don't understand how function. 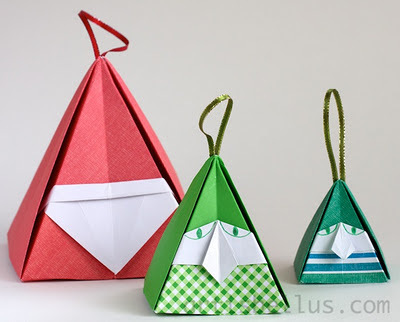 For instace the origami symbols as turn back the model,or how to draw a triangle or others form resulted in origami,need to download something special more as an origami software? I made searching for a tutorial but i don't find it. Can you help me a little more,some advices! Would help me of course! You'll have to create your own origami symbols, there is no library for that. If you google "open office draw tutorial" a few will appear (don't know if they are good, I just use the Help menu as assistance). Hi Marcela! I love your Origami cards! They are the most wonderful I've seen until now. I'm going to a wedding tomorrow and I'm desperately trying to make the wildflower but I'm havingtrouble with step 12. Do you have any video tutorial? Just got it!! Amazing result! Thank you! 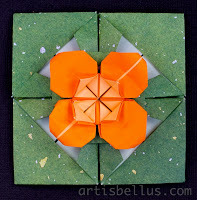 I ♥ all your origami work! 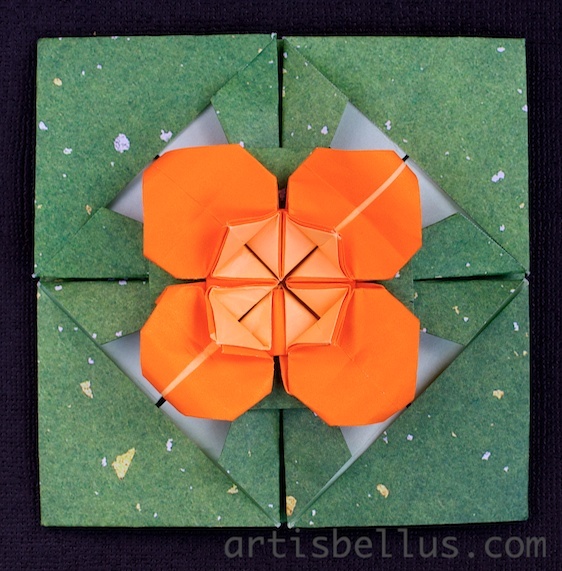 Did you try folding the wildflower from the video instead of the diagram? Sorry, I didn't mean to be rude. I just was saying that there is a another video that explains how to make the wildflower (http://www.youtube.com/watch?v=GBf9Tsq_6Ec&feature=plcp), so you do not need to fold it from the diagram. The video on this page is very clear and helpful, I like that you used a darker back ground color, it accentuates the model and makes it easier to focus on. Thanks for sharing the envelope design. I bought your book. I carefully followed the diagrams and instructions for the wildflower. It turned out beautifully. Thank you so much for sharing!